Door County Candy is proud of its long history and would love to share it with you! Check out below how we grew throughout the years! 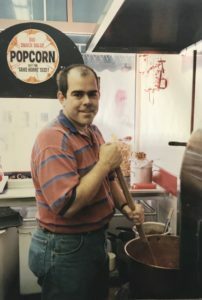 1996 – After Terry Ullman apprenticed with his relatives who own a candy shop in Colorado, he learned family recipes and opened Copper Kettle Confections in Sturgeon Bay, WI. He started a small store of 400 sq. ft. with just one display case full of chocolates, fudges, and gourmet popcorn. 1999 – Copper Kettle Confections began selling everyone’s favorite summertime treat ice cream! 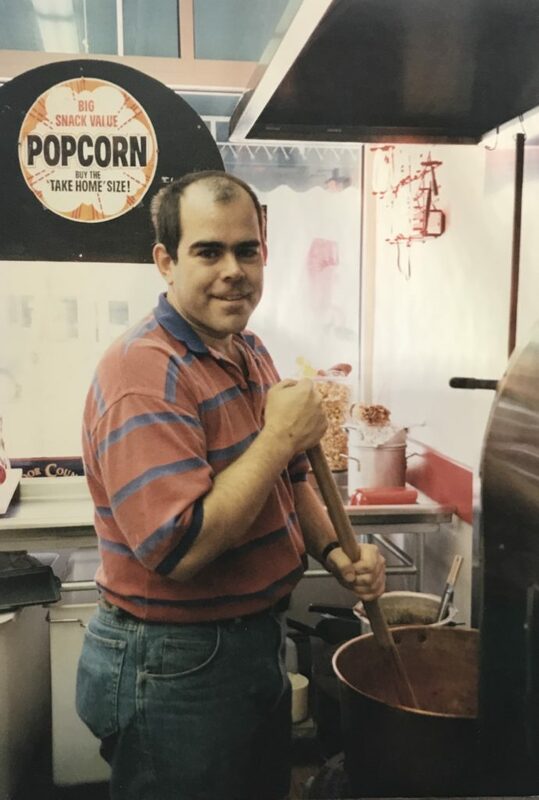 Terry started with 8 flavors, but quickly grew by 12 more flavors in 2001. Currently Door County Candy offers 16 unique flavors of ice cream from local business Cedar Crest. 2002 – Every summer sturgeons, benches, or lighthouses decorate Downtown Sturgeon Bay. In 2002, Terry and his sister Heidi created the Jelly Fish Sturgeon and bought it back in the auction to display in the store! The Jelly Fish Sturgeon was quite the undertaking; it took about 3 months to decorate with nearly 20,000 Jelly Belly beans. 2006 – Outgrowing the small space, Terry cut through the back of the store! This expansion doubled the shop’s size and allowed for additional varieties of merchandise. 2009 – After an 8 year battle with Sturgeon Bay City Council, the local businesses got their wish to convert Third Avenue to a 2-way street. Copper Kettle and other business were struggling to stay open due to the lack of traffic coming through. Two-way streets brought more cars and people through to boost sales significantly. 2010 – With newly thriving business, the funds were available to expand yet again! This time Terry would move his shop to a different, much larger location. Copper Kettle Confections moved 2 doors down the street and quadrupled in size to the business known today as Door County Candy! 2011 – After the move, the larger location called for inside seating. Terry acquired historic Kaap’s booths and display cases. 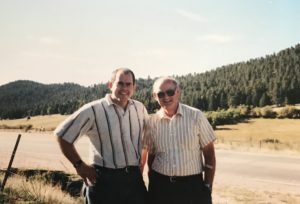 Kaap’s was a wonderful restaurant, candy store, and bakery located in Green Bay. 2012 – Door County Candy was able to offer outdoor seating for its customers this year. This was a great advancement for all people who wanted a place to sit and enjoy their dessert in the beautiful sun! 2013 – The business upgraded its POS and computer system to handle an increase in use and products. After looking inward on sales of candies, chocolates, and gifts, Door County Candy was able to decrease the variety of products to focus on what they do best: chocolates, fudges, popcorns, and sweets with a shining smile! 2016 – After a little construction, the store was rearranged to feature each product in the best way possible! The many varieties of salt-water taffies were displayed in flower buckets to create bouquets of taffy flavors. As well, new chocolate cases were purchased to highlight the additional homemade creations. 2017 to Present – Door County Candy is currently undergoing another expansion! Terry purchased the space next door at 20 N. 3rd Avenue. The two separate properties will become one with a major redesign. Once again, the store will grow by more than double in size. 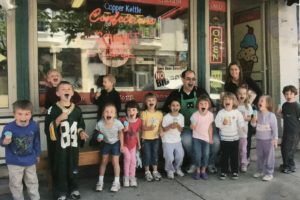 Door County Candy’s store will now reflect all of the fun and enjoyment that is part of their company culture!